Riverwalk Townes community is sold out and is not in active development by builder. If you are interested in Riverwalk Townes or similar new home communities, contact us today! Our agents are very familiar with new and newer construction in Yorktown, and can identify resale opportunities in Riverwalk Townes, as well as builder inventory available in nearby or similar communities in Yorktown. To view 11 more pictures, interactive maps and the full, detailed description of the Riverwalk Townes community, please Login. Enjoy all that life offers in a townhouse at Riverwalk Townes. The builder took great pride ensuring each new home would surpass expectations at affordable prices. These adorable attached homes are meticulously maintained by professionals so homeowners can sustain active lifestyles. 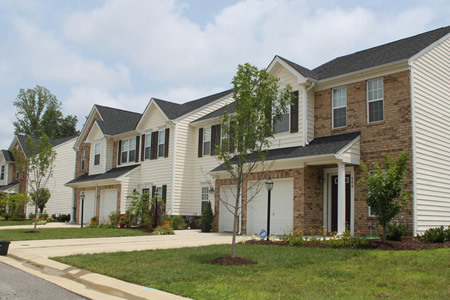 Perfectly situated in a pristine part of Yorktown, VA, this development is within minutes of military bases like Camp Peary, Naval Weapons Station Yorktown and Joint Base Langley-Eustis. What a task this builder took on to make this development so pleasing to look at as well as to live in. Who wouldn’t want a new home in such an all American neighborhood? Each townhouse here may feature one-car garage, brick exterior, covered entryway, ceiling fans with lights, hardwood flooring, recessed lighting, built-ins, stainless steel appliances, breakfast bar, open floor plan, tray ceilings, fireplace, loft, two-story great room, laundry room, sunroom and much more. The list of what is right with Riverwalk Townes just keeps going. Townhouse owners can indulge themselves on a daily basis here at Riverwalk Townes. Swim laps, practice synchronized swimming, play water polo and do the backstroke in the pool. After buying a new home, it’s always nice to meet the neighbors and where better to do that than in the community clubhouse? This builder left nothing to chance and took care of all the details when planning this neighborhood. The regions of Virginia are as diverse as the residents themselves. Yorktown is a shining star in the history of Colonial America and residents can see that historical significance abounds. A little more than a mile away from these townhomes lies Riverwalk Landing. This exciting waterfront locale offers shops, pedestrian walk, restaurants and a beach. Folks of all ages are entertained by concerts, lighted boat parades and an amazing Independence Day celebration that happen every year. Live in a land rich with Colonial American history. Know that each townhouse was constructed by an experienced builder who saw a vision of a better life and then built it. At Riverwalk Townes, you may come for a visit and leave with a new home. Send me more information about communities similar to Riverwalk Townes. Our agents gladly offer FREE property tours of Riverwalk Townes, Yorktown and homebuyer consultations to all serious buyers.